Red is a strong, energetic and stimulating color. According to Avicenna, it increases blood pressure, and is one of the warm colors (Pauline, ibid., P. 15 and 105). It helps digestion and red tablecloth increases appetite, (Paknejad, ibid., Vol. 5, p. 138). Human vision affects his appetite; that is why the Holy Quran commands that people should look at their food while eating. Red is a color which is known by babies from the very first moments of life, the red light is effective in the treatment of smallpox. It is a soothing color. It regulate the appetite and increases blood pressure (ibid, p. 155). Red is so irritating that it brings about headaches if looked at for a long time and a plant grows faster under the red light (ibid, Vol. 3, p. 243). Color red due to its warm and stimulating nature provokes the sexual instinct, for instance in a hadith narrated from Imam Baqir (PBUH), it is said that he was dressed in red. Someone told him, though it was tongue in cheek: “Some youth wear such clothes”. He answered: “Who has forbidden God’s adornments?” Then pointed out that he was newlywed (Majlesi, M. Baqir, Helliat-alMottaqin, p. 30). In another narration it is quoted that wearing red is disagreeable, except for someone who is newly married and this implies the stimulation of the color. In the Quran, the word “Hamr”(red) is used once (35: 27) and the word “Vardah” (red) once. (55:37). In this verse, God refers to the diversity of path colors and the colorful streaks in the mountains that are sometimes red. Here God has mentioned red between white and black; it may be due to its dominance among the mountains or some unrevealed reasons. Anyway, the importance of red in geology is clear here since red mountains are huge sources of volcanoes, the main features of which are their being heated and activivity and they outburst due to chemical changes. (Bolourdi, colors and messages in the Quran, Mishkat, p. 14). 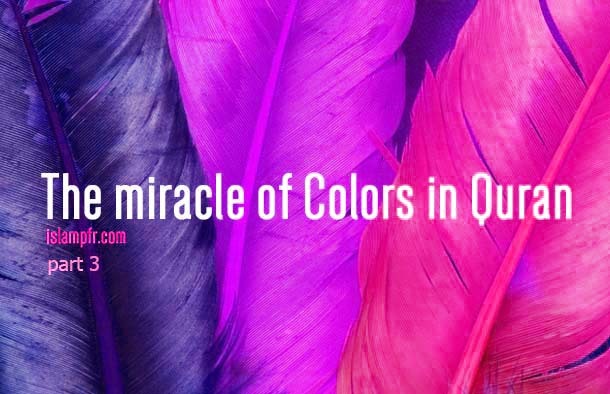 Professor Paknejad and Fathi Abdul Aziz believe in the miracle of color red in this verse, but because it is contrary to the commentators’ views, it cannot be conclusively approved. The red color of some rocks is due to oxidation of them and some rocks like granite are red in nature. From among other verses in which a colorful painting is created, is the verse 37 of Surah Al-Rahman. “And when the heaven is rent asunder, and then becomes red like red hide.” “Tabarsi” explains “Vardah in interpreting this verse. He says Vardah in this verse means “Roses”. It is associated to the sky in the day of resurrection which is as red as roses in being red and extremely hot. (Tabarsi, Majma-ol-byan). In explaining “Dahhan,” he writes: “The Doomsday sky is like colorful oils that some of them are poured over the other oils (and then becomes red like red) (Tabarsi, Majma, the same). The sky becoming red in the verge of the Doomsday shows the extremity of heat, excitement and fear which fills humans and therefore, the Quran mentions red as the color dedicated for painting the Doomsday and imply that the sky will become red and this adds to the fear and terror of the Day of Judgment. This metaphoric use of the red roses and frying oils for the day of Resurrection indicates that red is active and saddening and like most of the dark colors it is thrilling and this refers to the psychological aspects of colors. This color is directly used in the Quran only once (20:102), in the sense of grief and sorrow. “On the day when the trumpet shall be blown, and We will gather the guilty, blue-eyed, on that day”. Blue in this verse does not imply fear, except if it is mixed with black and criminals will be gathered on that day with bruised bodies (A report of miracles of colors, Journal of E’tedal). “Zorqa” means dark blue and the word refers to the intensity of blue; on the contrary, light blue which is the color of the sky and the seas, is very calming (Fathi Abdul Aziz Alwan fi al, p. 14). The blue color of the sky has a wonderful soothing effect on oneself, therefore; God made the color of seas and oceans (which reflect the color of the skies) blue. As a result it can be seen that God has painted man’s life according to man’s nature and spiritual needs and that’s another reason for God’s divine management. When one looks at the sky, he sees a blue sky that is calming and when looks at earth he finds the joyous green and this balance his mental state. Due to these properties blue is the best color for tiles in mosques and shrines. And at nights, the sky turns dark blue and that is the best time of relaxing and rest. It is quoted from Imam Sadiq in the book of “Tohid Moffazal” that: “Then think how God made the sky as dark blue at night so that it doesn’t hurt eyes when looking at repeatedly.” (Mahmudi, color in the Quran, p. 78). So the earth atmosphere has got diverse blues from day to night. Allamah Tabatabai writes about the meaning of the term Zorqa in this verse: “Zoroq is the plural form of Azraq (blue) that is a specific color” (Tabatabai, Almizan fi Tafsir al-Quran, vol. 14, p 226). Among all the interpretations he accepts the one that interprets “Zorqa” as the blindness of the criminals in the resurrection day, because the blind person sees everywhere blue and dark. Another interpretation he does not accept is that the criminals’ eyes turn into blue because this color is so hated among Arabs. (Pauline, the same, p. 15). Some effects of blue: Blue as Avicenna reported lowers blood pressure (ibid). It is a painkiller, relaxing, soothing and suitable for the treatment of insomnia (Paknejad, the same, Vol. 5, p.157). It is suggested for the bedroom, because this color is a tranquilizer (Pauline, ibid., p. 95). Blue is the color of relaxation, inspiration and convenience. In asthma, stress, insomnia and high blood pressure it works as a treating way. Sharp and clear blue is a sign of religious feelings, pale aqua blue is the sign of a deep belief and light blue is the sign of loyalty and devotion (ibid, p. 59). The Holy Quran never contradicts the scientific proved facts. And if based on the science, blue is a relaxing color, it is the light blue about which the Quran never explicitly comments on it. And if the Holy Quran depicts the criminals’ faces as blue, it is a dark blackish blue not the light one. According to this verse it is clear that the blackish blue like other dark colors symbolizes sorrow and wretchedness.